My subject for this blog is not on a Rule of Golf, but it is one that concerns many golfers. 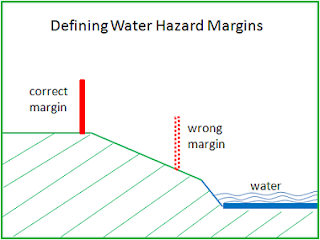 It is a fact that many golf course Committees wrongly define the margins of water hazards, especially lateral water hazards, by not including the sloping banks leading down to the water level within the margin. As can be seen from the rough sketch above, this may result in players who are taking relief from a lateral water hazard, under Rule 26-1, having to drop their ball on sloping ground, or at least having to take their stance on a slope with the ball above the level of their feet. This penalises the player twice, as they have already incurred a penalty stroke in taking relief from the hazard. In general, lines or stakes defining the margins of a water hazard should be placed as nearly as possible along the natural limits of the hazard, i.e. where the ground breaks down to form the depression containing the water. This means that sloping banks will be included within the margins of the hazard. However, if, for example, there is a large bush just outside the natural margin of the water hazard, it is suggested that the bush be included within the hazard margins. Otherwise, a player whose ball entered the hazard in this area may not have a reasonable spot at which to drop. If any course that you play has water hazard stakes/lines in the wrong place make sure that the Committee is made aware of the above, authoritative recommendation. I had no idea - thanks Barry ! We see this sort of thing quite often around here. The stakes are set up based on the highest level they think the water will rise. No, I was away this weekend and did not see any of the Phoenix Open. Was it definitely a lateral hazard (red lines and/or stakes)? If it was, then the Committee has no option but to define the margin somewhere on the slope. If the slope is fairly gentle there is not a problem, but if the slope is severe, resulting in the player having to play their dropped ball from way above the level of their feet, then I do think that the hole has been badly designed.